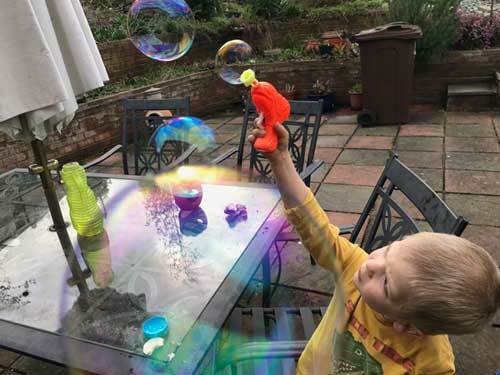 Joshua has had quite a few vaccinations in his four-and-a-half years – the usual routine inoculations for standard childhood illnesses and a couple (chicken pox and meningitis B) that are not on the NHS menu. The last time I took him out of nursery, this time for the flu vaccine, he asked me why we were going to the doctor, and I decided to give it to him in simple terms. With Joshua these days, you never know how much information he will end up retaining. His memory seems very fluid: he can easily forget an event that happened only moments before, but will then come out with something that he was told only once, months ago. I wasn’t sure if he had really been paying attention, but as he was sat on my knee in the GP surgery, the kindly nurse looming over him with a syringe, he spontaneously volunteered, “I’m getting pretend germs to teach my body how to fight the REAL germs.” The nurse was visibly astounded, then regrouped and told me how happy it made her to know that someone had bothered to explain it to him. Currently, the nursery is being decimated by chicken pox – when I picked him up today, the room was nearly deserted. So I told him about viruses, and promised to show him pictures on the phone when we got home. Together, we pored over images of virions in all of their strange and beautiful glory. He liked the science fiction monstrosity of T4 phage a lot better than varicella zoster, which he proclaimed to be a “boring spiky ball”. After I tucked him up in bed, he said, sleepily, “Mama, I know I have pretend germs, but how do they REALLY fight chicken pox?” I promised I’d draw him some pictures tomorrow – antibodies, perhaps, in simple terms, and how they act. I have tried very hard not to hold back on any scientific explanations when my son says “why”, no matter how further down the molecular or atomic rabbit hole it takes us. He seems continually up for the challenge, soaking in facts like a sponge, and enjoys the simple experiments we have done together when it turns out the answer to “why” can be demonstrated in some way. Not for the first time, it strikes me that his is precisely the age when this sort of information is best assimilated, and I always wonder if I am doing enough. I suspect this is my cue to plug my friend Alom Shaha’s new book, Mr Shaha’s Recipes for Wonder: Adventures in Science Round the Kitchen Table. He is also giving a free talk at University College London next week called “How To be your child’s first science teacher” if you want to know more. This entry was posted in Domestic bliss, Joshua, Students, Teaching. Bookmark the permalink.